I always appreciate a film that is done differently. It takes a truly creative director to make a film that looks and feels different these days. Michel Gondry is one of those creative directors that has his own brand of unique style that you won't see elsewhere. There are always so many movies coming out these days, and we watch so many that when something unique comes out it sticks with you. 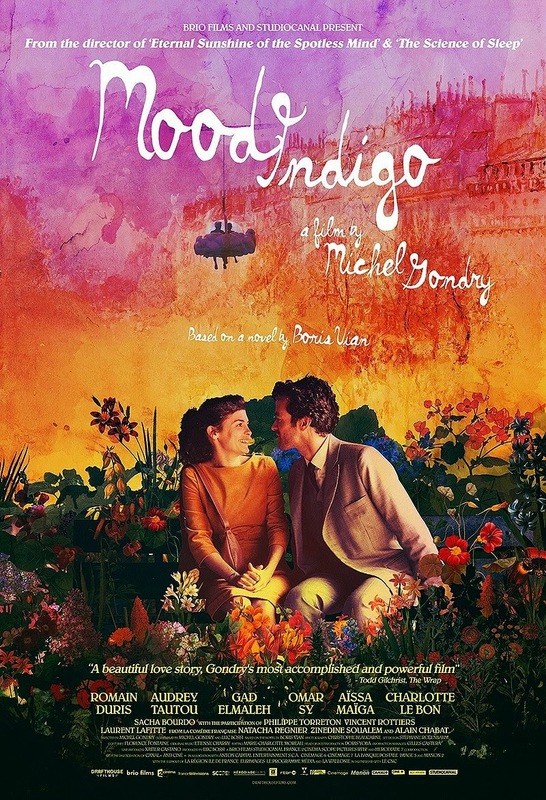 Mood Indigo is in some ways reminiscent of The Science of Sleep on a crazy drug trip, and I say that acknowledging that Science of Sleep was already too trippy for some. I might be in the minority but I like Michel Gondry and his style. He is one of the most unique directors when it comes to his production design and special effects. I like Wes Anderson for similar reasons. They approach film differently, with their own unique vision. Having said all that, with Mood Indigo Gondry built a strange world for his characters to inhabit. So strange you'll have to agree to stop trying to make sense of it and just let the story unfold. The story is based on a beloved French classic novel by Boris Vian. It revolves around a couple, Colin (Romain Duris) and Chloe (Audrey Tautou), who meet, get married, and deal with an unusual sickness. The unusual illness is a flower growing in Chloe's lung. Having not read the book I can't say whether the book is as whimsical or not, but the "unusualness" of the illness makes this story a perfect fit with Gondry's unusual world. In some ways its like Beauty and the Beast, or a film by Hayao Miyazaki where the whole world and everything in it, including what would normally be inanimate objects, are living breathing organisms. Generally we know where the story is going the whole time, but the way the film gets there is the stuff of great imagination. It understands that illness and tragedy creep in unexpectedly and blacken our whole world. The way the world transforms from its bright whimsical opening to its inevitable sad ending is a truly unique visual experience worth seeing. It does and it doesn't resemble the real world. It's unusual, playful, imaginative, like a dream sequence where anything can happen and we don't necessarily understand it or why it's happening, but it doesn't bother us that it's happening. Rarely do we get such a unique and beautiful set of imagery to play alongside such a sad story.